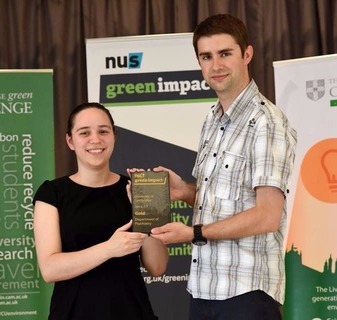 Each year, the Department of Psychiatry takes part in the Cambridge Green Challenge, part of the NUS Green Impact initiative. The aim is bring students and staff together to increase our sustainability and reduce our environmental impact. We’re going for the Gold award this year – and we need your help! paper – confidential waste bin in the Admin corridor. As we are unable to drink water from the tap, we have a water cooler. These bottles are reused and recycled by the company, decreasing the environmental impact. If you’d like to join the Green Impact team, or you have a suggestion for us, email Ave.
At the Herchel Smith Building we continue to do our bit for the environment. We recycle as much of our waste as possible, including electronics and batteries. We have a company that collects our used toners to be recycled and all the profit the company makes goes straight to charity. To save power we have most of our lights fitted with motion sensors to avoid lights being left on at night and the weekend. Last year our department was awarded Silver from the green impact team, we are now working hard to achieve gold. If you’d like to join in, email Rob. Here at Douglas House we like to look after our wildlife around the building. We ensure that our resident Brown Long Eared bats are left undisturbed in the attic, and when the Douglas House bees swarm we have them re-homed by the British Bee Keepers Association. We have also taken care of our feathered friends by placing bird feeders in the grounds. We are keen ‘Warp-It’ users and make sure that we re-home as much unwanted furniture and equipment as we possibly can. We carefully reuse as much stationery as possible and recycle the rest. Over the last two years we have reduced the number of printers we have in the building, and we make sure that we print double-sided and black and white where feasible. We are conscious of the energy used in the building and we remind staff to turn off lights and electrical equipment. We have even carefully stuck little stickers on the light switches to remind people as they leave! Audits are held in the morning before staff arrive to see how well we are doing, and results are then emailed to try and encourage everyone to do even better. We enjoy regular charity events at Douglas House including an annual Easter Egg Hunt and Christmas Quiz with prizes for the best Christmas jumpers. Over the last three years we have been awarded first Bronze, then Silver and now Gold for our work with Green Impact. Some changes have been harder than others, but we’ve had fun along the way and continue to enjoy thinking up new ways to be green at Douglas House. Winter jumper fun at the HSB!